The High Huts of the White Mountains are eight mountain huts in the White Mountains, in the U.S. state of New Hampshire, owned and maintained by the Appalachian Mountain Club. Modeled after similar huts in the Alps, they are positioned at intervals along the Appalachian Trail, allowing "thru-hikers" (those who hike the entire Appalachian Trail) to benefit from their services. They are generally separated by six to eight miles, about a day's hike. Hikers can reserve overnight bunks at the huts, which hold from 36 to 96 people each. In summer season (June through mid-September) the huts are "full service", serving dinner and breakfast. Three huts stay open the rest of the year as "self service", allowing guests to cook their own food in the kitchen. The huts are staffed by a team of five to nine caretakers - often called "the croo," using that spelling - during full-service season. Each crew member works for eleven days on, three days off. During the eleven working days, they must make four trips back down the mountain to get perishable food and other supplies, carrying heavy loads. At the beginning of each season, fuel and supplies are flown into the huts by helicopter. The huts were built and are maintained by the Appalachian Mountain Club's construction crew. The huts have handled thousands of hikers entering the back woods and environmentally sensitive areas above tree line. Four years and an environmental impact statement were required to get the huts' permits renewed by the U.S. Forest Service in 1999. The following High Huts are presented in the order they would be reached when hiking the Appalachian Trail from south to north. Greenleaf Hut (44°09′37″N 71°39′37″W﻿ / ﻿44.1603°N 71.6604°W﻿ / 44.1603; -71.6604﻿ (Greenleaf Hut)) lies on a prominent shoulder of Mount Lafayette, with views of Franconia Ridge. Its construction was the first to leave behind the stone and masonry construction technique utilized by earlier huts, and to use a team of burros to carry materials. Completed in 1930, it pioneered running water and indoor toilets, reflecting an evolution of AMC huts from simple shelters towards becoming more like mountainside hostels. Much of Greenleaf's construction funding came from Colonel Charles Greenleaf, for whom it is named. Its design — a central dining room and kitchen flanked by two bunkrooms — became the model for Galehead and Zealand Falls huts, both constructed within the next year. It is 4,200 feet (1,300 m) above sea level. Galehead Hut (44°11′16″N 71°34′08″W﻿ / ﻿44.1879°N 71.5688°W﻿ / 44.1879; -71.5688﻿ (Galehead Hut)) lies nearly 3,800 feet (1,200 m) above sea level on rugged Garfield Ridge. Construction on the original structure there began in 1931, using wood from the surrounding trees. It was completed in 1932, along with Zealand Falls Hut, its closest northern neighbor. A small space under the front porch was used to store perishable foods. In 1938, Galehead gained a temporary 360 degree view when the Great New England Hurricane blew over all the surrounding trees. It was replaced in June 2000 with a new Americans with Disabilities Act-compliant hut, complete with a wheelchair ramp even though it is 5 miles (8 km) of rough trail from the nearest trailhead. Given its altitude and remoteness, the vast majority of the new structure's materials had to be carried in; thus mainly lightweight materials were utilized. New features include composting toilets (already in use at Mizpah Spring Hut, Carter Notch Hut, and Lonesome Lake Hut), both solar panels and a wind vane for producing power, and a foundation fastened to the granite bedrock with grouted rebar, giving the hut the ability to withstand winds up to 125 miles per hour (200 km/h). 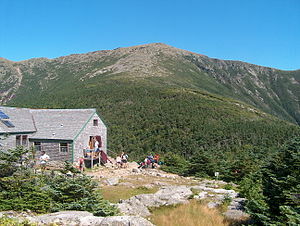 The hut is 0.9 miles (1.4 km) from the summit of South Twin Mountain and 0.5 miles (800 m) from the summit of Galehead Mountain. Zealand Falls Hut (44°11′46″N 71°29′40″W﻿ / ﻿44.1960°N 71.4944°W﻿ / 44.1960; -71.4944﻿ (Zealand Falls Hut)) was completed in 1932 along with Galehead and has been open in the winter season since 1973. It, like Lonesome Lake hut, is notable as a "family" hut due to its low altitude and relatively easy approach climb. It also has the lowest capacity of all the huts, sleeping little more than a third of the largest capacity hut. Madison Spring Hut (44°19′40″N 71°17′00″W﻿ / ﻿44.3277°N 71.2832°W﻿ / 44.3277; -71.2832﻿ (Madison Spring Hut)), originally built in 1888, is the oldest hut site in the United States. The first overnight guests stayed in the winter of 1889, and in 1906 a fee was instituted to utilize the shelter — 50 cents per night. The original hut was expanded in that same year, as well as 1911, 1922, and 1929. However, in 1940, a fire — caused by the ignition of gasoline for the gasoline-electric power generator — destroyed much of the hut. The following year it was rebuilt and re-opened. The hut was extensively rehabilitated in the fall of 2010 and early 2011. Carter Notch Hut (44°15′33″N 71°11′44″W﻿ / ﻿44.2591°N 71.1955°W﻿ / 44.2591; -71.1955﻿ (Carter Notch Hut)) is the easternmost hut in the system and is open year-round. Between 1996 and 2006, it operated on a self-service basis; since then it has resumed operating as a full-service hut during the summer season, remaining self-service the rest of the year. The site's use as a shelter began in 1904 as a simple log cabin; the building was rebuilt as a hut in 1914, making Carter Notch the oldest building in the hut chain, supposedly by Milton McGregor, aka "Red Mac". There are two bunkhouses located a short distance from the main hut structure; thus from the cliffs above, the hut is viewed as a small compound. There are two small ponds located nearby, as well as a tremendous boulder field. Carter Notch helped establish the hut as a viable pursuit for the AMC, and after its initial success, the group began to lay plans for a hut system. ^ "White Mountain Huts of New Hampshire - AMC". www.outdoors.org. ^ "Historic Profile: Lonesome Lake Hut". AMC. Archived from the original on 2006-09-29. Retrieved 2009-04-22. ^ a b "Lonesome Lake Hut". AMC. Retrieved 2009-04-22. ^ "Historic Profile: Greenleaf Hut". AMC. Archived from the original on 2008-12-27. Retrieved 2009-04-22. ^ a b "Greenleaf Hut". AMC. Retrieved 2009-04-22. ^ Carey Goldberg (August 17, 2000). "For These Trailblazers, Wheelchairs Matter". The New York Times. Retrieved 2009-04-22. ^ "Historic Profile: Galehead Hut". AMC. Archived from the original on 2008-12-27. Retrieved 2009-04-22. ^ a b c "Galehead Hut". AMC. Retrieved 2009-04-22. ^ "Galehead Hut Blends the Best of the Old and New". AMC. Archived from the original on 2008-12-27. Retrieved 2009-04-22. ^ "Historic Profile: Zealand Falls Hut". AMC. Archived from the original on 2010-01-16. Retrieved 2009-04-22. ^ a b "Zealand Falls Hut". AMC. Retrieved 2009-04-22. ^ "Historic Profile: Mizpah Spring Hut". AMC. Archived from the original on 2009-02-15. Retrieved 2009-04-22. ^ a b "Mizpah Spring Hut". AMC. Retrieved 2009-04-22. ^ "Historic Profile: Lakes of the Clouds Hut". AMC. Archived from the original on 2009-08-06. Retrieved 2009-04-22. ^ a b "Lakes of the Clouds Hut". AMC. Retrieved 2009-04-22. ^ "Historic Profile: Madison Spring Hut". AMC. Archived from the original on 2009-02-15. Retrieved 2009-04-22. ^ a b "Madison Spring Hut". AMC. Retrieved 2009-04-22. ^ a b "Carter Notch Hut". AMC. Retrieved 2009-04-22. ^ "2009 White Mountain Hut Rates". AMC. Retrieved 2009-04-22. 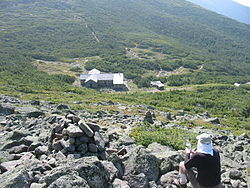 ^ "AMC Carter Notch Hut Returns to Full Service in Summer 2007". AMC. October 11, 2006. Retrieved 2009-04-22. ^ Perry, Tristan. Ghostly Legends of the Appalachian Trail. Wever, Iowa: Quixote Press, 2008. Pages 77-91. ^ "Historic Profile: Carter Notch Hut". AMC. Archived from the original on 2009-02-14. Retrieved 2009-04-22.